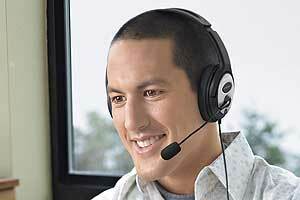 Take your audio experience to a new dimension with the Microsoft LifeChat LX-3000. Optimized for Windows Live Messenger, this comfortable, high-quality stereo headset gives you the simplicity of USB installation and high-quality digital sound that cannot be matched by analog. Hold clear, private Internet voice calls, enjoy music and movies, and become fully immersed in your games. Windows Live Call Button - It's simple to start voice calls. One touch of the Windows Live Call Button lets you see who's online, and you're on your way towards audio chatting. Visit us online to download Windows Live Messenger. *Pauses audio in iTunes and Windows Media Player. Other application behavior may vary. ** Windows Live Messenger or MSN Messenger contacts only/broadband connection required.